A Peach in a Pear Tree's New Midlothian Bakery Is a Sweet Expansion | Food and Drink | Style Weekly - Richmond, VA local news, arts, and events. Scott Elmquist Alicia Darnell and her sky-high cakes are back after a year-and-a-half absence. She’s also expanding a Peach in a Pear Tree’s hours to serve breakfast. Success can cause delays. When Alicia Darnell opened her bakery on Patterson Avenue, it didn’t take long to realize that she needed a larger space. A month after opening, comedian Steve Harvey’s show posted a photo of her butter pecan cake on Instagram — and it went viral. Six months later, Darnell knew she had to move A Peach in a Pear Tree Dessert Boutique. It was a bold step: She closed up shop while she focused on finding a bigger, more well-designed location. It took a year and half to find one. When you walk into her new bakery in Sycamore Square Shopping Village in Midlothian, the warmth from the ovens and the fragrance of the baked goods make you want to sit down and stay a while. Darnell, a tall, precisely put-together Louisiana native, still looks like the senior administrator she once was. But instead of talking about human resources, she discusses such topics as chocolate fudge sky-high cakes — her favorite — and how carefully she must mix the batter for temperamental macarons. She took cake-design classes and started a custom-cake business in addition to her full-time job. “But my passion was baking and entrepreneurship,” she says. 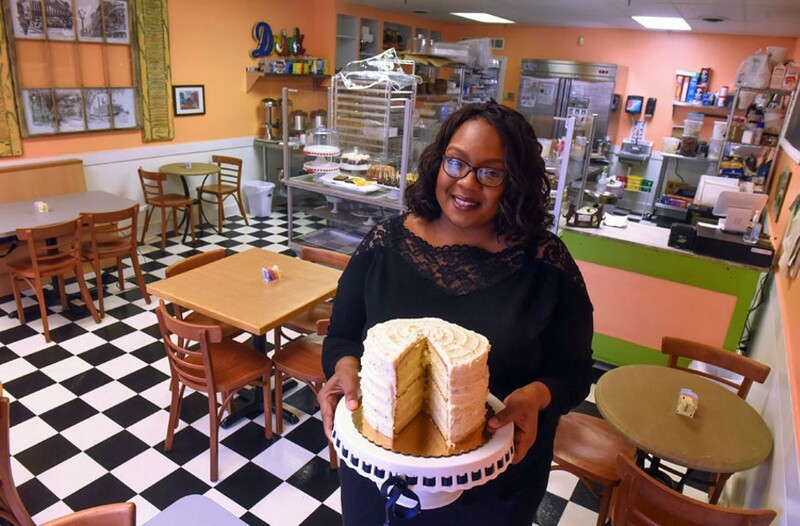 She realized she couldn’t continue to do both as her cake business bloomed, and in 2014, she decided to take the leap and open her own bakery. The response was immediate, and since her move to South Side in late 2016, regulars have followed her and the neighborhood has warmly embraced the new business. She operates a little differently than most bakeries in town. “In Louisiana, there’s the tradition of the lagniappe — a little something extra,” she says. Darnell might include a cookie along with customers orders, just to let them try one out. Although she has help from her family and an extra baker, Darnell still gets up around 5:30 a.m. to bake and stock the cases for the shop’s opening. The business is also transitioning this month to new hours to offer breakfast. Mardi Gras is right around the corner, and Darnell is taking orders for authentic king cakes. She’s also expanding her online business and will start shipping her goods later this year. Eventually, Darnell says, she wants to open another shop in Atlanta, where she has family. The growth seems fast for a bakery that started in 2014. Darnell reminds me that she began her business at home seven years before that.